NON-US Orders must contact grit@apppa.org for a shipping quote. The book is a compilation of Jeff’s previous health and nutrition articles, feed rations, case studies, and feeding trials. And the good news for people who don’t want to spend a lot of time reading through unnecessary details, this book is just like having a conversation with Jeff (in email or phone). Brevity reigns. This is a technical reference to raising poultry on pasture for profit. 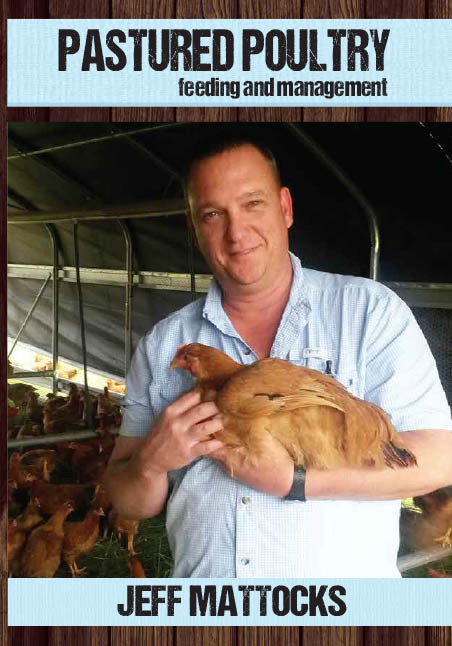 The emphasis in the book is on maintaining proper nutrition and health as the basis of a profitable flock. In other words, everything starts with what the birds eat and is affected by the producer’s management decisions. Jeff provides rations for broilers, layers, turkeys, and ducks including some no-soy chicken variations. They’re formulated based on Fertrell’s vitamin and mineral premix, but he does include a chapter on formulating your own rations using the Pearson Square, which is a simple way to create a balanced ration from two ingredients. There’s also multi-species ration included in the book. This ration was well received when APPPA published it in the Grit because it enables multi-species farms to produce one ration. Jeff provides directions to adjust the ration at feeding for the different species through the addition of vitamins/minerals, calcium, soy, or fishmeal. And the feeding adjustments include layers, turkeys, broilers, goats, pigs, sheep, cattle, and horses. Slow Growing Poultry, Too Jeff expands his coverage to slow growing poultry and provides rations for standard-bred (heritage) turkeys and chickens. This suite of rations contains the expected variations for starter, grower, developer, and meat production. It also provides rations for breeders in a non-laying time of year. Troubleshooting Jeff includes three flowcharts to help diagnose and treat illness, mortality, and leg problems. The charts give you a pathway to identifying some of the most common problems.